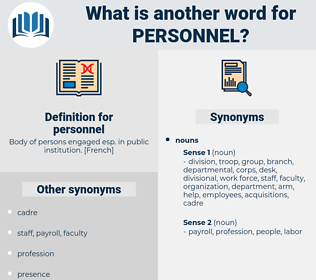 What is another word for personnel? 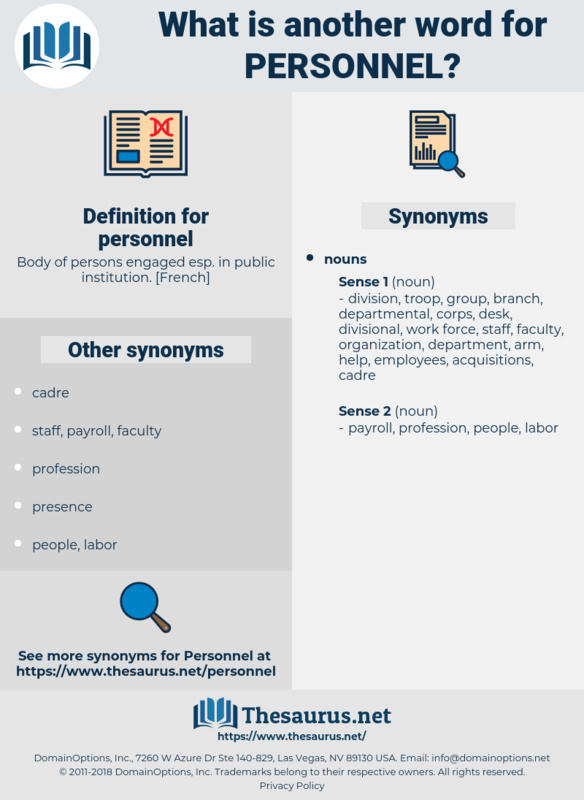 employers, officials, practitioners, matters, procedures, Occupations, Hires, clerks, settlements, fellows, skills, Languages, notices, frameworks, items, events, states, counts. responsibilities, civilians, inspectors, organisations, purposes, CREWS, components, cadres, Investigators, representatives, personages, professions, memberships, Personalities, Policemen, Administrators, perpetrators, installations, constables, technologists, relationships, conscripts, Salaries, levels, factors, sponsors, reports, aircrews, explosives, institutions, suppliers, Regulations, weapons, contractors, Specialists, Nurses, results, reservists, commissioners, volunteers, investigations, witnesses, staffers, spectators, Populations, minds, technicians, Evaluations, subordinates, observers, panellists, Duties, prisoners, Operators, sources, Consultants, Respondents, rapporteurs, interlocutors, stakeholders, Injuries, counterparts, laborers, materials, collaborators, handlers, Expenditures, shortages, processes, responders, managers, Records, recipients, competencies, pixels, journalists, reductions, bureaucrats, owners, requirements, souls, labourers, scientists, Demographics, Capabilities, residents, recruits, attendants, projects, sectors, Beneficiaries, innovations, Auxiliaries, beings, aspects, doctors, Organizations, settings, Physicians, Sciences, issues, expenses, visitors, interns, distributors, engineers, appointees, Governments, airmen, citizens, experts, constituents, passengers, peacekeepers, assistants, aviators, Patients, systems, technologies, Clients, Ones, Casualties, Veterans, colleagues, wardens, problems, Policies, scholars, occupants, contributors, participants, foreigners, contributions, points, plans, Constituencies, fighters, practices, files, holders, applicants, magistrates, Functionaries, Workmen, envoys, trainees, Standards, Males, offenders, reasons, entrants, Researchers, rescuers, benefits, players, pathogens, suspects, teachers, associates, questions, clinics, Families, Cops, ranks, orders, assessments, combatants, changes, contracts, licensees, speakers, trainers, tasks, arrangements, Efforts, diplomats, programmes, Categories, priorities, Agencies, users, TECHS, centres, drivers, redundancies, MINERS, brokers, couriers, Students, Vehicles, Areas, provinces, Charges, inhabitants, circles, codes, limbs, Bodies, Lives, graduates, directors, Surveys, women, Friends, Conferences, Adults, herds, Entities, dealers, militants, arrivals, educators, challenges, substances, contacts, Companies, Remedies, Capacities, places, Celebrities, candidates, grades, incumbents, Activities, Pupils, detainees, wizards, cases, Universities, objectives, Carriers, controls, Inquiries, targets, Brains, groups, PCS, auditors, deaths, NATIONALS, musicians, ridings, functions, actives, frames, Facilities, Refugees, degrees, Classes, Programs, subjects, features, partners, Businesses, visits, makers, Bandits, cutbacks, Foundations, committees, quotas, needs, offices, artists, Bases, operatives, cars, Undertakings, boys, mandates, Characters, actors, data, guys, MINES, VOTES, heads, Parties, victims, audits, providers, figures, cuts, employers, officials, practitioners, matters, meetings, procedures, Occupations, Hires, clerks, fellows, skills, notices, frameworks, items, events, states, counts, fonctionnaires. Policemen, Personae, Militiamen, Guardsmen, Capita, items, states, office-holder. Deployed, represented, arrested, tested, seized, netted, attached, understaffed. I find that I have so far omitted to give the personnel of Talbot's crew. After you escaped the entire personnel of the garrison here was changed, even the old servants to a man were withdrawn and others substituted. paramilitary organization, guerilla force, guerrilla force, work force, management personnel, service, patrol, private security force, military personnel, military service, constabulary, armed forces, rank, war machine, police, rank and file, workforce, mp, law, soldiery, men, military, line personnel, staff, military machine, manpower, hands, armed service, military police, Paramilitary Organisation, paramilitary unit, security force, paramilitary force, police force, armed services, paramilitary, troops.